A good home tour always gets me on Pinterest! I love seeing all the beautiful spaces and the stores behind them. I find myself on there more often than ever before as I research projects I want to do, and look for inspiration. I've always been one to take pride in my living space. Even my college apartment said “home” rather than “help, I'm hungry!” Truth be told I wasn't hungry cause my momma would meet me halfway on the highway to bring me Sunday dinner. Love that woman! But home, each one, whether I rented or owned was a space I took time and put effort into making comfy. Lately, I have been spending lots of time on Pinterest for inspiration and while I hoped it would leave me feeling fired up and ready, it also left me feeling a few other things – like inadequate, frustrated and even stressed. I get excited about home projects like some people get excited about shopping trips. The before and after is euphoric for me. But I also suffer from a thing called a lack of patience. Like I expect ideas to come to life as I speak them to my husband. And life, well it just doesn't work that way. The problem with all of this is, for me, it can cause this ugly thing called ungratefulness. Where nothing is good enough if it's not the way I want it. Leaving me to forget and even discount my blessings. I say all this in a moment of complete transparent self-reflection. 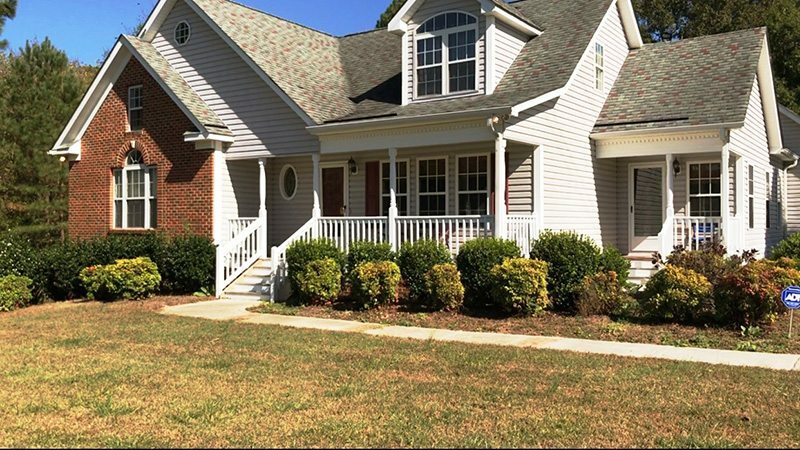 Because when we moved to North Carolina a little over a year ago, we moved into a home we had never seen in person and rented for 1800 dollars a month. I don't know if you think so, but that's a lot of money to just give someone every month. My husband didn't start working until February, after moving in August. And by May, we were both itching to 1) have a home of our own and 2) hopefully lower our monthly housing expenses, as owning was cheaper than renting. But what we didn't know was if that would be possible with such short time on the job and the gap in employment. 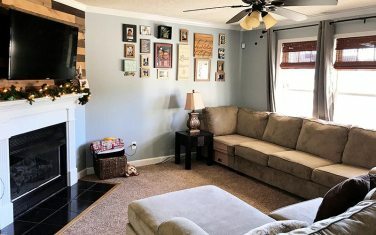 It all totally worked out and while this house isn't my dream home, it is what we could afford, that had enough space for everyone and some of the things we wanted with the ability to make it into a space we absolutely love. I would have to have patience. So now, being here 6 months, and not having done half of the things I want to do. I started to not just visit, but live in a space of being ungrateful. And as I began doing my yearly, end-of-year reflecting it dawned on me how blessed we truly are. And, so that I can look back and see all the progress we have made at this time next year. 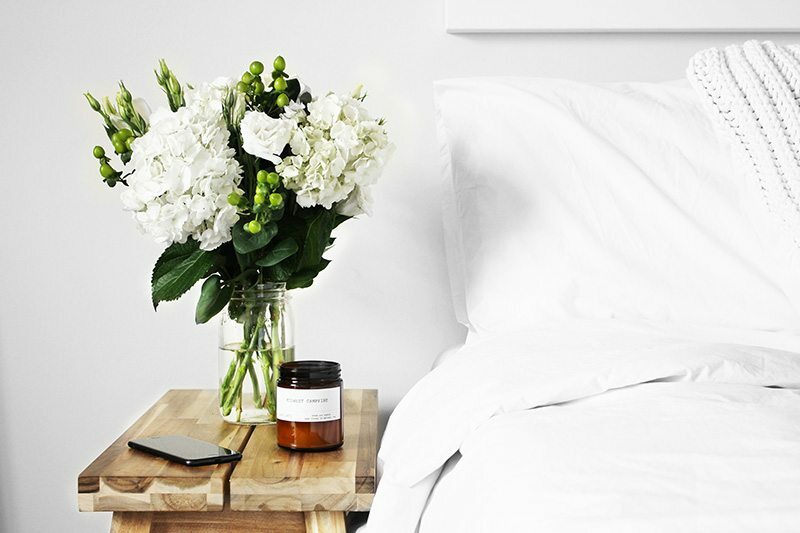 Because the reality is, my home is never gonna be one of the Pinterest perfect homes with white bedding, perfectly placed pillows, and all that jazz. This will never be my home! It's nice, but not at Casa de Hampton…. Shoot I can't wear a white shirt without a hand print or something making its way to me. Maybe before children, but seeing as how I have three and the last won't be grown for 13 years, ha! That's just not my reality. So this is my imperfect home. And I wish I had the photos of when we first moved in to show you that even in six months we have made great progress. So without further ado, here are my humble living quarters. Before we go further, let me just say that some of the links you will see are affiliate links. If you make purchases from them, your prices are not affected, the vendor just gives me a little change for sending you their way. You can read my full disclosure here. This is the room I spend the least amount of time in. Laundry is not my thing. But I would like for this room to be organized and visually appealing. My goal is to install cabinets for storage in here along with a counter that can be used as a folding space. The floor is currently linoleum which goes into the kitchen and dining space and the downstairs bathrooms. My plan is to replace the floor with wood look ceramic tile. 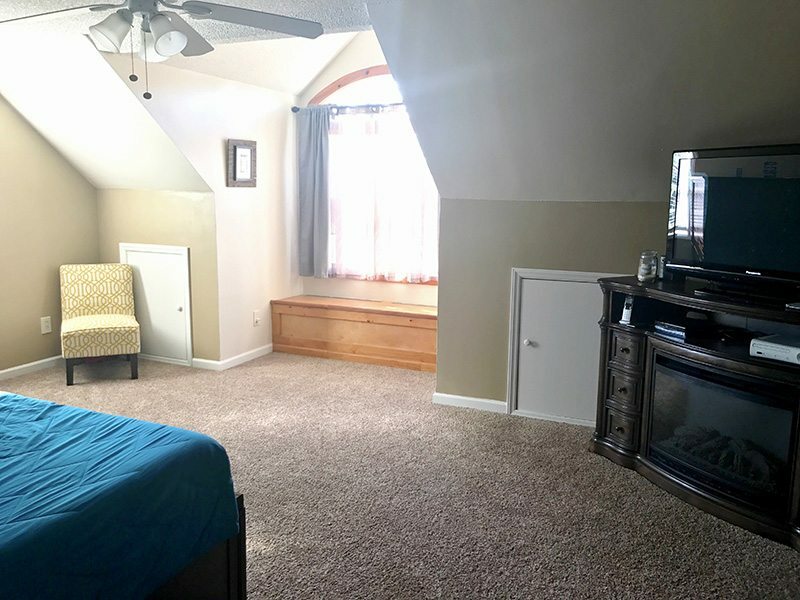 In addition to updating the flooring in here, I plan to change out that god-awful light. I have not been able to decide exactly what I want to go with in there that will be cute and functional at the same time. I absolutely love all the natural lighting that comes in this space with the three windows and the door with a window center. This has to be my second favorite space in this house. But definitely the place that I spend the most time. My dad came and painted the kitchen and dining room for us when we first moved in. All the way from Ohio… he loves me. Painting the cabinets was my first project in this house as I could not stand to live with those ugly colored Oak cabinets that were here. Good quality, not so much on the eyes. I went with a shade of gray by Sherwin Williams named Dovetail. 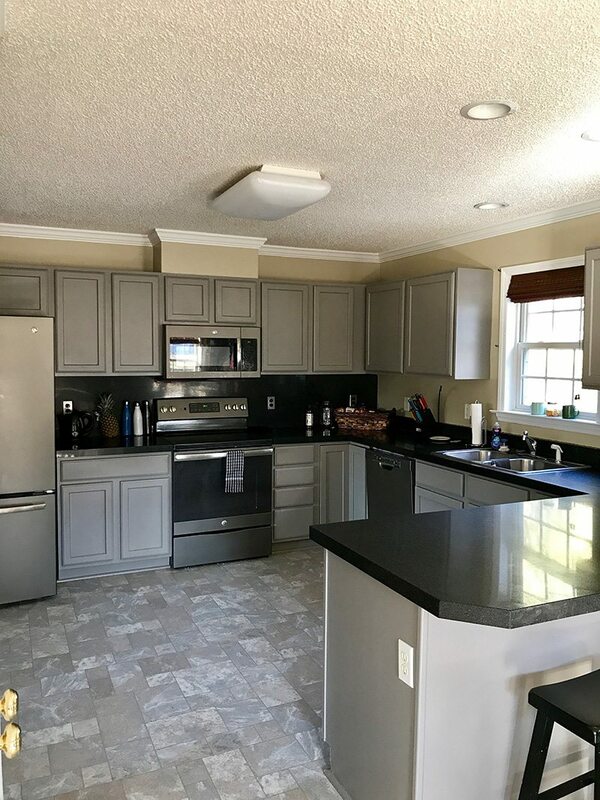 I intended to raise the cabinets to the ceiling (which I am still thinking through), makeover the countertops, install a backsplash and I still haven't decided on the hardware I want to add. Like all rooms in this house, they came with newly updated popcorn ceilings. who does that? and so I also have a plan for my ceilings as well, because scraping them is NOT the business. At least not my business anyway. Don't you just love those popcorn ceilings??? Once I have my way, there will not be a popcorn ceiling trace left to be seen outside of a photo. They will be a distant memory. But this room was painted soon as we moved in. I usually do straight neutrals with accent walls, but decided to do something different this time around. 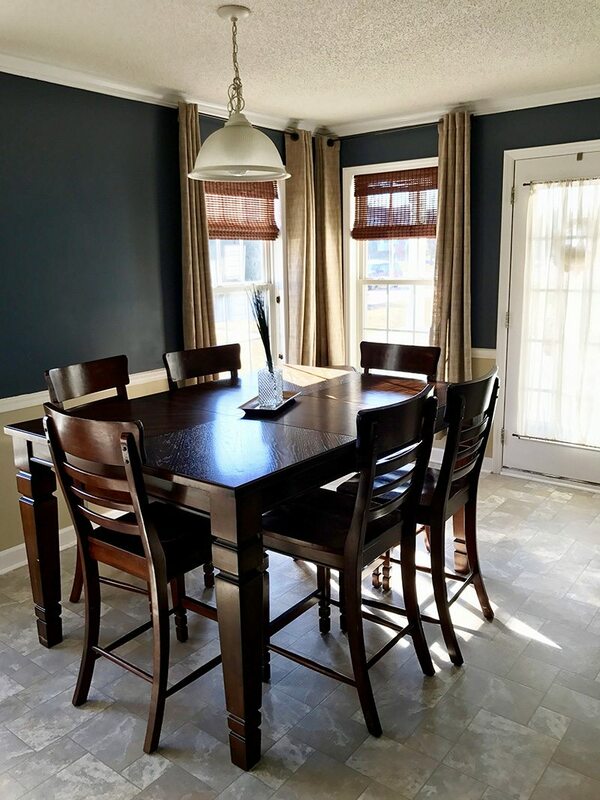 I opted to paint this room a nice soft hue of blue/gray. This shade is Meteor Shower from Home Depot's Behr line of paint. My friend and I knocked out this paint job soon as we got the keys because I didn't want to have to move furniture or risk getting paint on it because my living room set is so large. Although it is a sectional, I separated it for Christmas and since I liked it that way, I decided to roll with it for a while. 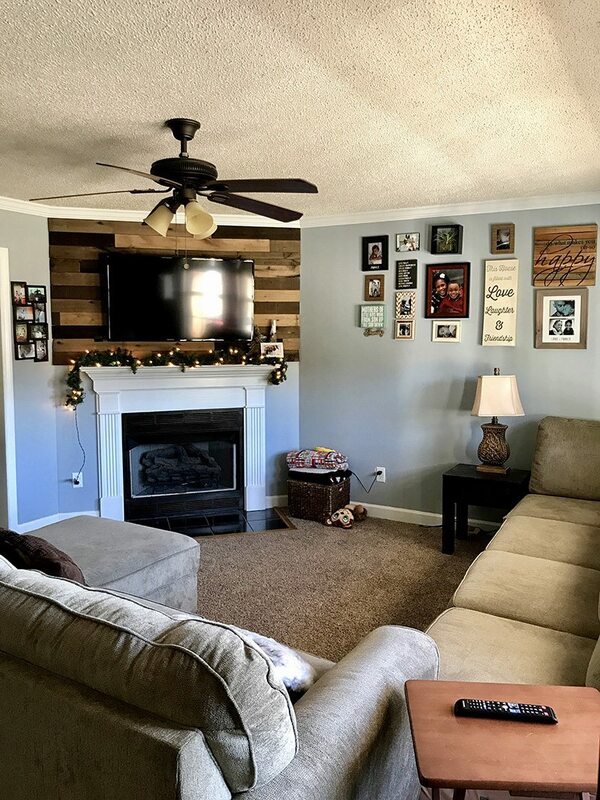 We recently closed off the open space above the fireplace that was slightly awkward by doing a wood planked accent wall. A quick project that cost less than $100. I also put a fresh coat of paint on the fireplace casing to freshen it up too. I have not done a single thing in this space. Not nothing. The mix-match curtain and rug are things we had. This is the boy's bathroom which also serves as the guest bathroom. 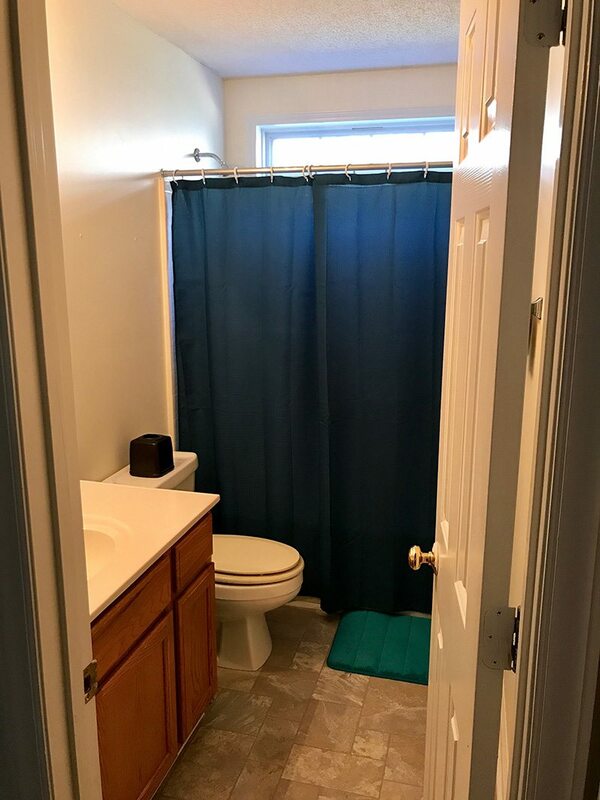 My plan is to do wood-look tile in here as well, update the vanity with paint, beadboard the wall, and makeover the sink in a similar way that I did in our last home. I love that it has a window that offers a light source in here. The bathroom in my room does not and it feels closed in to me. 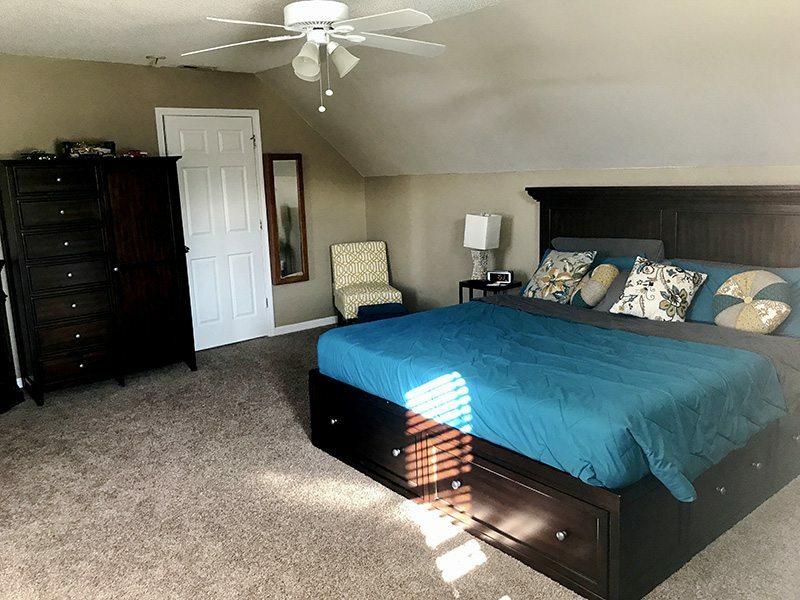 This is the room that was listed as the master bedroom on the listing. 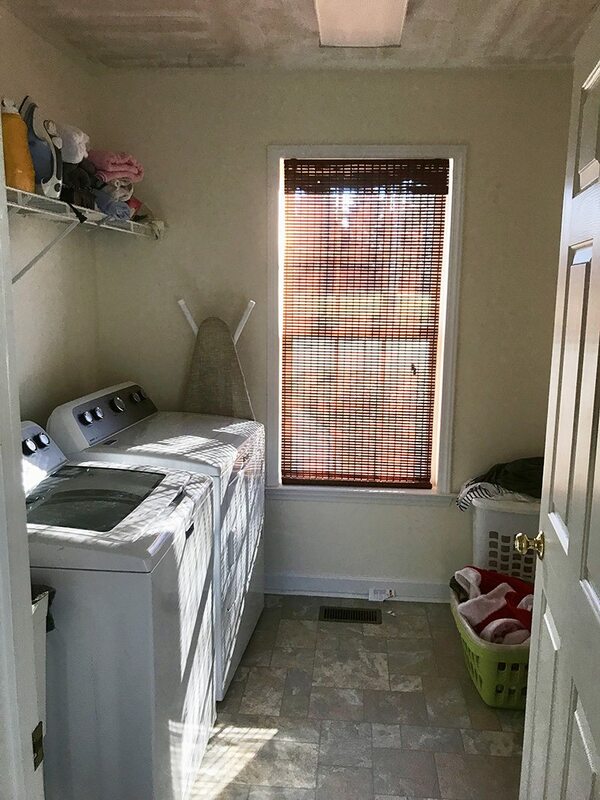 It has a double vanity, soaking tub, and a window in its bathroom, along with a walk-in closet. But it is also on the first floor with the boys. We decided the kids could have the first floor, so this is my daughter's room. 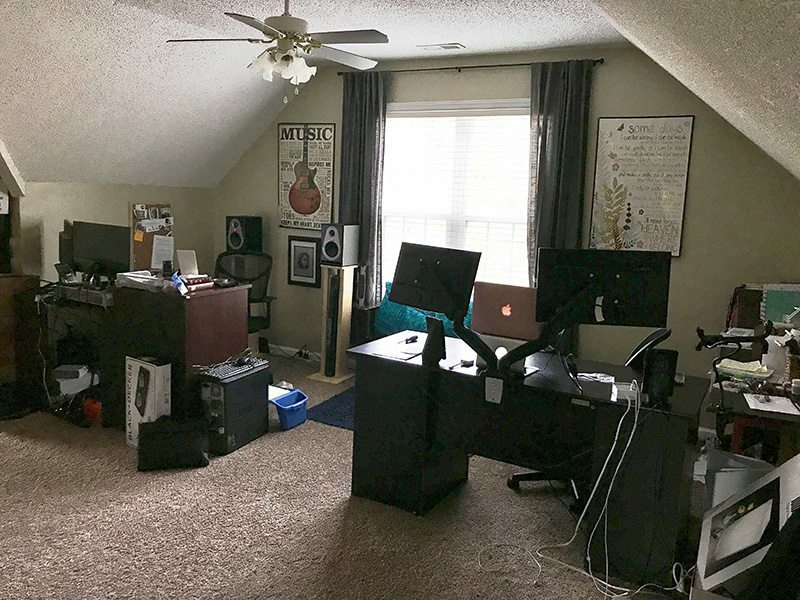 We opted to take the two bedrooms upstairs as our own and office, which affords us two separate walk-in closets and a level of the home that is all our own. But having a first-floor master is a great feature in the event this is our forever home. I have bad knees and I don't know what the future holds. We didn't want to feel we had to buy a new house when we aged if we needed to be on the first floor. This room just needs some paint on the walls, and a little decor, oh and a new ceiling, and it's good to go! This is how I know that scrapping popcorn ceilings is not the business! Not only did they popcorn the ceiling in here, they thought it would be cool to popcorn the slanted walls too! I could not wake up to that every morning. So our first week here we made a mess scrapped and smoothed the slanted walls and painted them. The middle ceiling is still popcorn because we tapped out. There are a few ideas I have for that space. I have always wanted a window seat! Currently, I have been looking at fabric to make a window seat cushion and rug for this room. 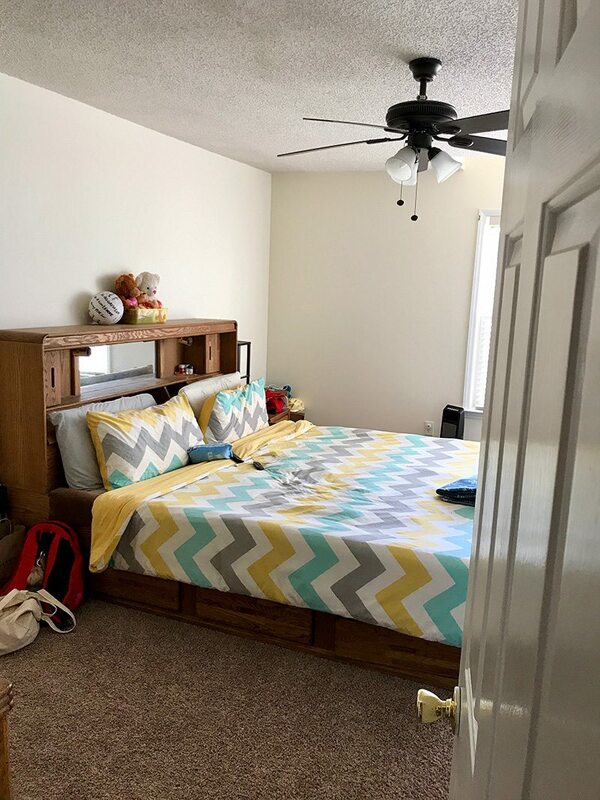 The ceiling fan is in need of a replacement or crafty update as well. And I plan to do floating nightstands on each side of the bed with some updated decor. I spend a great deal of time in this space. It is the most ongoing project in the house. When we moved it was kinda of the drop stuff that we didn't know where we wanted to go space because the storage units are also off the office. So things make their way to the office to be sorted and eventually stored, discarded or given a home. I have finally gotten where it does not fully stifle my creative energy, but it does happen from time to time, and I end up having to find other places around the house to work. It is a shared office space with the old man. And as I get into the design and decor of it, like our bedroom, I am trying to balance the femininity and masculinity of the space. Some of the things that I have in mind for the office is built-in bookshelves, possibly building identical desks like this one from Sauder , and a sliding barn door for the bathroom (right now it opens inward in a weird way that drives me crazy). So far I have built the side shelf next to my desk to give me more space to store accessories like notebooks, pens and house my photo light, photo boards, and stuff underneath. Created useful desk space by using this double monitor mount , and we used the existing shelves that we had for right now in place of the bookshelves we will build, and we painted the walls. Like all the other rooms, I plan to, at some point tackle these popcorned ceilings and in this case walls too. UGH! I left out the boys rooms and the additional 2 bathrooms. At the time I tackle them, I will include before and after photos. While this space is not what I want it to be, it is my home and I am thankful for it. I look forward to all the love and projects that we will put into it in the coming months and years. Stay tuned for more projects in the coming months! I love the idea of an imperfect home tour and the perspective you maintain with yours. It’s always better to consider what we have than what we don’t! Funny you say that. I was thinking about that. Like I have things I need to donate and give away but yet I am making lists of what I still need. We live a very abundant life and often times forget it. Thanks for stopping by Jazzmine! I love it!! 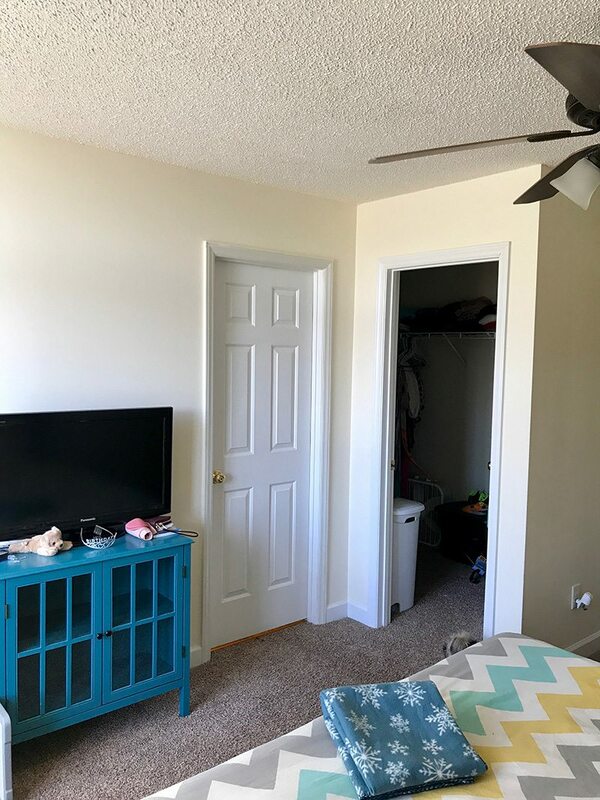 I think the one thing in terms of “decorating” my house is I can’t really change the natural lighting, which is often part of the downfall because pinterest images can be so deceiving as far as natural lighting goes. But I think what you have done is gorgeous! !